Hunting magazines often display colorful photographs of huge bull elk standing in open meadows presenting easy targets. The reality in the mountains of Colorado, however, is far different. Stalking these animals is challenging and you likely won’t get an easy shot. You’re more likely to find elk on a steep hillside, in a dark ravine, or in thick timber than standing out in the open. The hunter success rate for all manners of take in Colorado was 22 percent in 2010, with a total of 48,018 animals harvested. 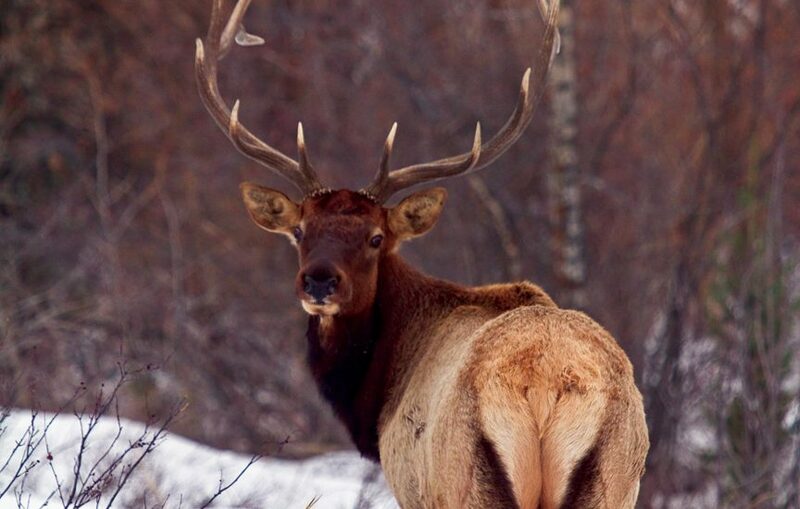 A total of 214,535 hunters stalked elk last season. It’s estimated that there are about 280,000 elk in Colorado, the most of any state. If weather is warm, elk stay spread out over vast areas at high elevations at and above timberline. In those conditions hunters need to work extra hard. When snow falls, elk will usually start to move, bunch up, and look for food sources at lower elevations or on slopes where vegetation is exposed. However, the snow fall must be significant; usually more than a foot of snow must be on the ground to get elk moving. Get off your ATV and hunt slowly and quietly far from any road. Elk are smart, move quickly at any hint of danger and hide in rugged terrain. Compounding the challenge is the fact that elk typically gather in groups of 10 or more. If one is spooked they all move and they can run easily for a mile or more. Elk are most active during the night and are likely to be grazing in transition areas — meadows next to heavy timber, where different types of vegetation meet and just above or below ridgelines. Watch these areas at first light and at dusk. During the day, move into the dark timber — cool north-facing slopes — and don’t be hesitant to hunt in difficult areas. Move as quietly as possible for short distances and then scan the woods for 10 minutes or more before moving again. Even in dense forest use binoculars to discern subtle movement or unusual colors in the trees.